Join Reid and the Crossroads Leadership team at our 2018 All Leader Launch. This is our once-a-year event that includes all 4 campuses, ministry departments and missions teams where we can celebrate what God has done and prepare for what He is calling us to do this Fall. Save the date now! We will also take time as a team to pray, learn and worship God for our next steps within the ministries we lead within. Who should attend? 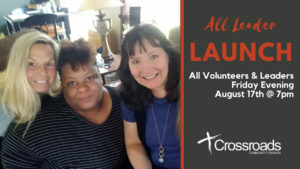 Anyone who volunteers for a ministry, event or community organization within, affiliated with or a partner of Crossroads Community Church. In addition, we welcome anyone interested in volunteering in some capacity for Crossroads in the future. Food trucks available at 5pm in the parking area until 6:45pm. Leader Launch begins at 7pm.